love this rug. look for months since I am in a wheelchair and needed rug that wasn't to thick but was durable. this rug is perfect and affordable. Great quality rug. I have it in red and brown and also gray and brown. They have a Nice design and are soft to walk on. They were both reasonable priced and look great in my living room and dining room. I highly recommend this rug. Good quality, easy to clean, bright vivid colors. This area rug adds great cushioning to my feet. Soft to lay on, too. This rug is a great compliment to a room for those who love a splash of red. Color is bright enough to pull in focus but no overwhelming. The contemporary pattern is a nice contrast when decorated with earth tones. Nice pile for the price. Would recommend for a friend. I have no complain about the carpet, it's nice. It is not too thick and too thin it just perfect. I purchased it thinking it will match my living room but it has two shades of brown. That's why I am returning it otherwise it's nice. If you living room has one color decor then this is for you otherwise its too overwhelming and hurts your eyes. It hurts mine because too much going on but like i said it's nice otherwise. 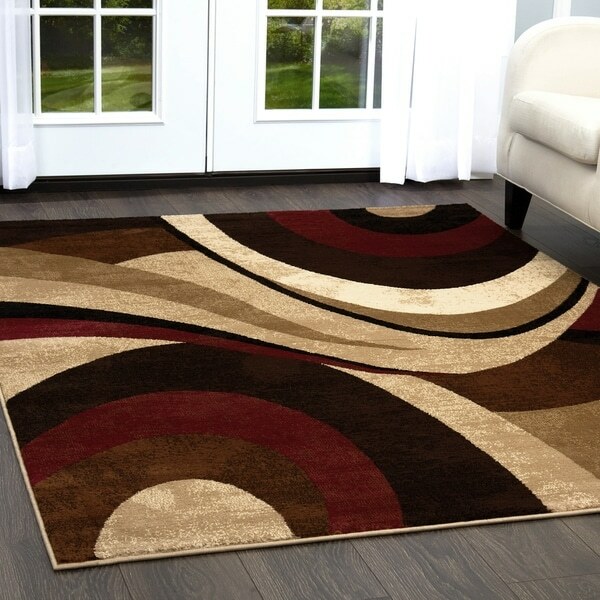 The rug has a very soft feel, I love the colors they're vibrant and match everything I have. It was delivered on time, as promised. I would order this again in a heartbeat. I love my rug. It goes perfect with my living room. It's soft and very cozy. My Grandbabies also love laying on it. I have gotten so many compliments. Needed an accent rug, and this looks like it will be what I need. By the way, I didn't see the additional 15% discount, was that included in the sale price? "I would like to order 8 by 10"
Unfortunately this is not available in 8 by 10. "Id like to order matching throw rugs"